It’s been a week since I hit the refresh button on the http://jlsc.com/winners/2014b/finalists.php that had been sitting open on my browser from earlier in the day. 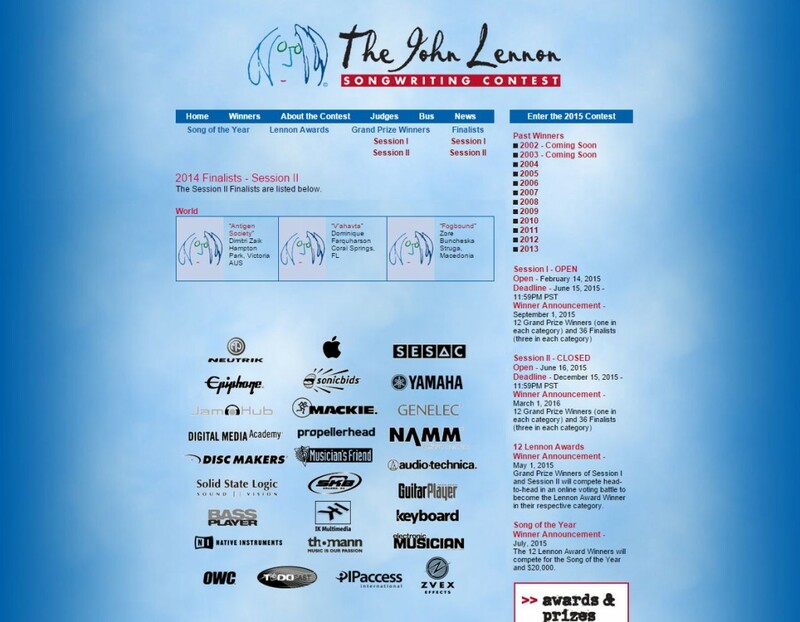 It was May 1st the day the winners would be announced for the John Lennon Songwriting Contest Session II 2014. I had quite hopelessly opened it at around 8 a.m Melbourne time. Living right on the edge of the date line makes things a little difficult the 1st is more like the 2nd when the rest of the world catches up but thats a different story. For some reason at six p.m I opened that particular tab and thought oh heck why not check. And there it was the light blue text had turned black and into clickable links. With a slightly flapping in my stomach I clicked the link. I submitted my songs for the competition from the ‘Magellanic Clouds’ with my last funds for December my mother funded one being the rock solid support she was. I somehow managed to convince my self the ‘Fuschia Dynasty’ should go under electronica even though it was probably no where close. But ‘Antigen Society’ just wouldn’t fit anywhere except “World” the broadest category of the lot and arguably some of the most talented composers/musicians in the world. And here I was merely a boy, with zero musical theory knowledge armed with nothing but my emotions and dreams transposed to notes and a home recorded track with a whole load of makeshift instruments, standing amongst seasoned performers and crazy Indian Sitarists who could play with their toes. Thus I reckon if there ever was the faint chance of hope mine was in ‘Fuchsia Dynasty’ it was the best received from the people I had managed to get the album out to. My winner track ‘Paperweight Moons’ was longer than the five minute requirement and I was never going to shorten it, even for a submission. So the little flapping in my stomach died instantly when my Fuschian melody was nowhere to be seen, I pretty much put my phone down and sighed to myself and said oh well I tried. Morgan, who was next to me probably felt my split second of hope crashing and burning and she gave me a hug and said I was still good enough. Now for some reason one of my fingers had flicked against the screen and it had scrolled it self down to the bottom of the page. The world category as expected was the last of the lot and when I looked at my phone low and behold the first listed song was Antigen Society – with my name sitting under it. The dead butterfly, now clearly a zombie flapping frivolously set off a whirlwind in the pit of my stomach. I don’t really recall what happened. But I was moving, and I was moving fast, swirling around with a vortex of emotions. Breathless, senseless, I vaguely recall interrupting my mother in the middle of a meeting, Morgan smiling like it was no surprise to her and firing a call to Talia. Who of course didn’t answer her phone. But she did call me back within a few minutes of my text “Answer your damn phone”, worried that something had happened. I think I made matters worse with my shaky and barely audible voice. And then when she finally got what I was trying to say she did the thing that only Talia can do and it was just an array of unbelievable emotions flooding in. I had in me the strength to make a few more calls to people that mattered and most importantly Chinthaka who had been there for most of my more hopeless and psychotic endeavours trying to make music. Having bonded and grown up listening to the Red Hot Chili Peppers almost all our lives nothing could have been better than Flea being one of the judges. “Dude Flea heard you” is all we could say. It had all just paid off in one moment. A little boy who dreamt... had just been given a green light to chase down those dreams harder than ever. Since then it has been an exhausting week trying to put together everything and embark on that journey… The petals of A Dandelion Clock, were about to be released into the world.